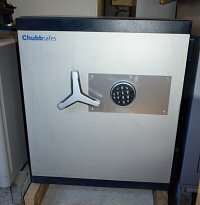 A very high security Chubb safe, made for jewellers or Banks. The safe is fitted with all security features required to get the £100,000 cash and £1,000,000 valuables insurance rating. The safe has two high security combination locks which must be operated in the correct sequence to open the safe. To give you an idea of the level of security, the safe weighs around 1.5 tons. 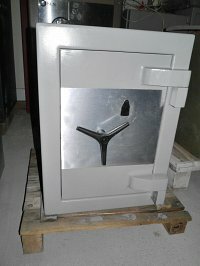 Internally the safe is 1040x500x500mm. Because of the weight, we would have to quote you individually for delivery, or you can pick it up of course. 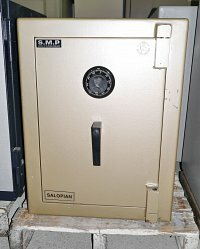 A reasonably sized and heavy duty SMP safe, made in the UK. The safe is fitted with a high security combination lock, and is 460x305x295mm internally. It weighs around 250Kgs, unlike most of the junk for sale on the web, but can also be bolted to the floor from the inside of the safe. Don’t let the size or price deceive you, this is a very good and reliable safe which will withstand very determined attacks with ease. Why risk leaving your valuables unprotected at this price. We can send the safe to you on a pallet for around £75.00 plus vat (£90.00 total) for kerbside delivery, or you can pick it up from us in Blackburn, Lancs. We can also quote you to deliver and install the safe if you wish. This is a very heavy duty safe, fitted with a high security 9 lever lock and comes with two keys, but we can cut more if required. These safes are very reliable, and in our opinion built much better and heavier duty than any of the latest Grade 0 safes that are meant to replace them. These are what we call proper safes - made in the UK not China. The safe will weigh around 350Kgs - compare that to the modern stuff you can buy on the web !! Just in case, for your peace of mind the safe can also be bolted to the floor !! Internally the safe is 480x300x290mm. Why buy more expensive junk ?? We can deliver the safe on a pallet to most UK destinations for around £75.00 plus vat for kerbside delivery, or you can ring the office for a quote for delivery and positioning. 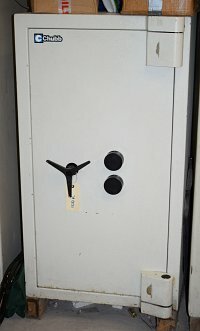 A high security Chubb safe, made to keep up to £35,000 cash or £350,000 valuables overnight. The safe is fitted with a high security digital lock and is 600x500x365mm internally. We can send the safe to you on a pallet for around £75.00 plus vat (£90.00 total) if you can handle kerbside delivery, or you can pick it up from us in Blackburn, Lancs. We can also quote you to deliver and install the safe if you wish.